Anyway, you have to ask to join the group and once accepted, you will get their offers in your feed of cheap cleaning supplies and toiletries, and they will also send you a price list of items they have available at the time. 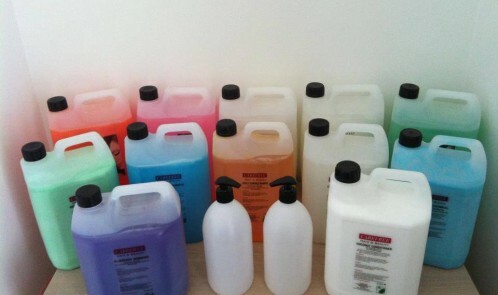 These items range from shampoo, washing powder to stain removers and massage oil. I bought 36 toilet rolls, 65 dishwasher tabs, a five litre kitchen cleaner solution, which needs to be diluted when put into normal spray bottles, five litres of hand wash and five litres of antibac washing up liquid. All delivered in large containers for £31. You have to pay cash and the guys who run the operation will let you know when they are delivering in your area. It took me two weeks to get the items but I won’t have to buy them too often and for the saving, I was happy to wait. If you are a clean freak, or have room to store the stuff or run a small cleaning business, the service definitely seems worth a try. Update: the cleaning fluids are still going strong as is the soap four months in, but the loo roll wasn’t worth it.